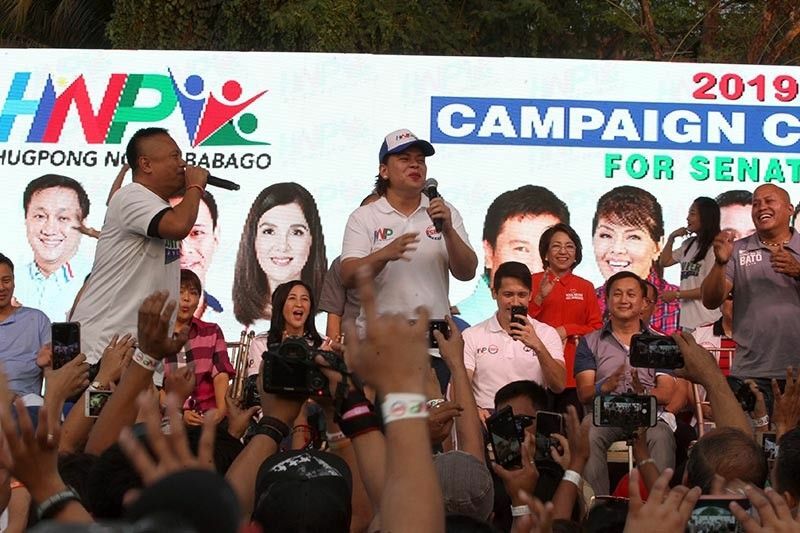 Hugpong ng Pagbabago slate campaign manager and Davao City Mayor Sara Duterte sings together with rapper Andrew E during the caravan held at Amoranto Stadium in Quezon City on March 1, 2019. MANILA, Philippines — Senatorial candidates of the opposition slate Otso Diretso are challenging administration bets to a debate to gain publicity, Malacañang said Sunday. Presidential spokesman Salvador Panelo said administration candidates did not accept the challenge because they did not want to give their opponents media mileage. "I can understand that those from the other side, they want to debate because it would give them publicity. They (administration candidates) did not want to give their rivals publicity," Panelo said in a radio interview. "Eh ganyan talaga. Ganyan ang labanan dito sa Pilipinas. Matira matibay (That's how it is in the Philippines. Survival of the fittest)," he added. Otso Diretso bets invited their rivals from the administration-backed slate Hugpong ng Pagbabago to a public debate at Plaza Miranda in Quiapo, Manila that was supposed to be held last February 25. Hugpong bets did not show up because there was no agreement about the rules and venue, according to presidential daughter and Davao City Mayor Sara Duterte, who is also the party's chairperson. Her remark prompted Otso Diretso bets to ask the Commission on Elections to organize a debate. Panelo said it would be up to the candidates to decide whether to join debates. "The Palace need not advise them, they’re running for the Senate then it’s their call," he said.